The 4th book in the popular 101 ANIMALS series! Did you know that sea turtle mothers leave their babies to hatch from their eggs completely on their own? Or that baby gorilla black-backs are carried around for as long as three years after they are born? In 101 Animal Babies, readers will learn about penguins and sea-horse fathers that guard and hatch their eggs, birds that teach their chicks to fly, kangaroos that keep their joeys safe in pouches, and wolves that teach their pups to hunt. 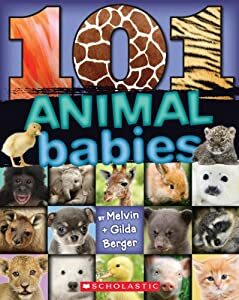 Filled with fascinating facts and adorable full-color photos on every page, 101 Animal Babies is sure to be an instant favorite for kids, parents, and teachers alike! I have had the chance to review other 101 Animal books in the past and my daughters loved them and they love this one too! I was very impressed with the great information is shared in this book. YOu learn SO much in a short amount of space. At the same time the book is filled with amazing images of so many animals too! This was a comprehensive look at the babies of many different animals and everyone young and old will learn from what is shared within!